Today, PLF filed an amicus brief urging the Supreme Court to reconsider the First Amendment’s relationship to campaign contributions in a case called Illinois Liberty PAC v. Raoul. The case challenges an Illinois law that imposes contribution limits on all individuals and groups except political parties and their leaders. The case would allow the Court to reconsider a precedent called Buckley Valeo, which held that campaign contributions should receive less First Amendment protection than other forms of political expression. This issue is of special importance with the looming threat of H.R. 1, a massive campaign-finance bill that threatens to trounce Americans’ rights to political speech. Congress’s first serious attempt at comprehensive campaign finance regulation swept through in 1971 with the Federal Election Campaign Act. FECA laid down strict contribution and expenditures limits. Six years later, FECA led to Buckley v. Valeo. Buckley was a mixed bag. On the one hand, it struck down limits on independent expenditures by people who spend their own money on their own political communication during a campaign. On the other, it upheld limits on direct campaign contributions. Hence, both sides of the campaign-finance divide gripe about Buckley—First Amendment advocates want campaign contributions to be just as uninhibited as independent expenditures, and campaign-finance believers think government should be able to curtail independent expenditures to the same degree as campaign contributions. PLF’s brief argues that Buckley did not do enough to protect First Amendment interests. Buckley relied on flawed notions about the nature of campaign contributions and the alleged need for limiting them. For example, the Buckley Court claimed that contributions don’t deserve as much First Amendment protection as expenditures because the speech facilitated by the contribution is someone beside the contributor. The trouble is that the same is true of expenditures—typically a political spender’s message is conveyed through a go-between, like an ad agency or a TV station. Courts have never held that reliance on someone else to convey your message robs you of the right to promote that message. Except for Buckley. Another rationale for distinguishing contributions and expenditures is the “general” nature of a contribution. An expenditure allows the speaker to tailor his precise message. I.e. : I support Elizabeth Warren because of her Native American heritage. But if you just give a contribution to the Warren campaign, then no one knows why you support her. You could be contributing for any reason, and the lack of specificity translates to a weaker First Amendment right. This is another lame excuse. After all, does the guy holding a “Warren 2020” deserve less First Amendment protection than someone holding a “Harris for better healthcare” sign? No case has ever said so or will ever say so. Except for Buckley. The third rationale for contribution limits is that the quantity of the contribution does not strengthen or weaken the speech being regulated. That is, Buckley says if you give $5 or $500 to the Booker campaign, your message is the same. But surely the number is a clear metric for degree or intensity of support. If you gave $1 to Harris and $100 to Warren, that says something about your viewpoint. If a cap is placed on contributions, the government is essentially saying that you can only support your candidate up to X amount—that’s more than a minor burden on someone’s right to political expression and participation. Plus, the contribution is not just about the symbolic act of giving—it’s also about the speech facilitated by that contribution, which is obviously affected by the quantity of the donation. Buckley allowed contribution limits for the sake of combating corruption or the appearance of corruption. Here, too, Buckley falters. Study after study has failed to demonstrate that campaign contributions purchase special favors on anything approaching a widespread basis. Yet contribution limits take a widespread approach. Certainly, anecdotal evidence of quid pro quo exchange of contributions for favors exists. But that can hardly support a widespread cap where the overwhelming majority of contributions are motivated by ideological commitment, not a desire to obtain special political favors post-election. 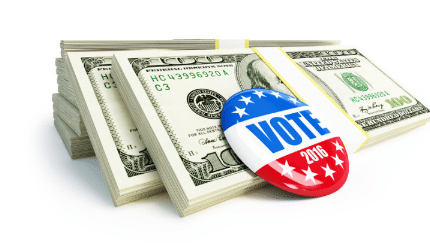 Bereft of actual evidence, campaign finance zealots resort to bumper sticker slogans like “money buys elections.” Certainly, candidates who receive a lot of money tend to also receive a lot of votes. But this is just correlation. People will tend to donate to strong candidates, and people will also tend to vote for strong candidates. The likely variable here is a candidate’s popularity, not campaign contributions. And what in the world is the “appearance” of corruption? No other First Amendment right that I know of lives or dies by the grace of the subjective feelings of the public. Rights are supposed to exist despite any prevailing hostility from the public. Yet that’s the Buckley standard. Indeed, courts have looked to public opinion polls and other tenuous evidence to uphold severe contribution limits in cities and states across the country. While contribution limits likely don’t do any good, they do plenty of harm. Even beyond the injury done to the First Amendment interests of contributors, campaign finance laws tend to only help one group of people: incumbents. Campaign finance laws erect such arcane labyrinths that only the savvy, experienced politicians who can afford pinstriped election-law attorneys and heaps of name recognition will come out ahead. Contribution limits also do huge favors for wealthy, self-funded candidates. Often, what political amateurs with no name recognition need is a concentrated boost of support from a small group of supporters to kickstart a competitive campaign. Contribution limits make this nigh impossible. But instead of loosening campaign finance laws that fortify incumbency, politicians peddle terrible ideas like term limits. If they truly wanted competitive politics (which they don’t), then they’d liberalize campaign finance. Since we can hardly rely on the incumbents to break down incumbency protections, the time has come for the Supreme Court to return to Buckley. The Court will have the chance to do just that in Illinois Liberty PAC. We could do for some fresh air in politics—the way to do that is to strip away an orthodoxy that only serves to protect the powerful.